The parish was united with Lethnot ca. 1618, but they were separated again in 1723. General histories listed on the page for Books about Angus & Kincardineshire, in particular Warden, vol. 4, pp. 221-232. For the full range of maps of Lochlee, see National Library's Maps. Geograph.org: Loch Lee - recent photographs at east end of Loch Lee. National Grid ref. NO4380. 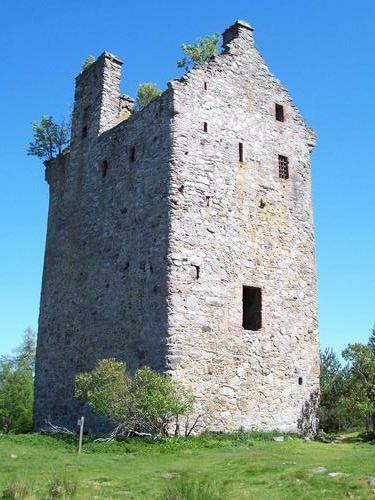 Geograph.org: Invermark - recent photographs at Invermark Castle. National Grid ref. NO4480. Geograph.org: Tarfside - recent photographs at Tarfside. National Grid ref. NO4979. 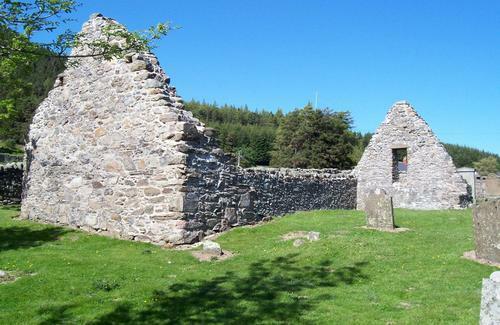 Above: the ruins of the former parish kirk of Lochlee, at the east end of Loch Lee, National Grid ref. NO431801. The mediaeval church was dedicated to St Drostan. 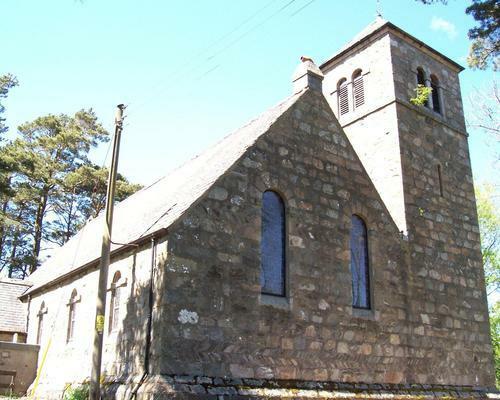 Above: the present parish kirk of Lochlee, located at National Grid ref. NO446804. Built in 1803. 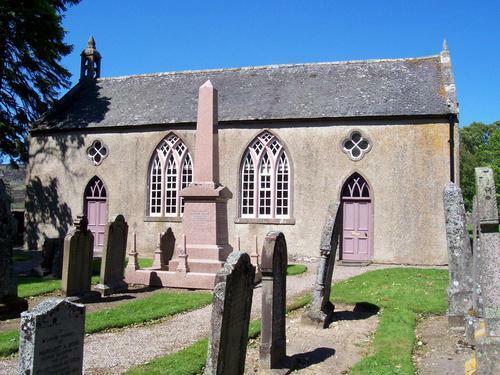 Above: Maule Memorial Church of Scotland, Tarfside, at NO496795, built in 1857 as Tarfside Free Kirk on land given by Fox Maule Ramsay, 11th earl of Dalhousie, 2nd lord Panmure of Brechin & Navar. In the east gable of the kirk are a memorial window to Ramsay, with his coat of arms (Ramsay's eagle displayed quartered with Maule), and one to Dr Thomas Guthrie, a leader of the Disruption of 1843 that led to the formation of the Free Church of Scotland. 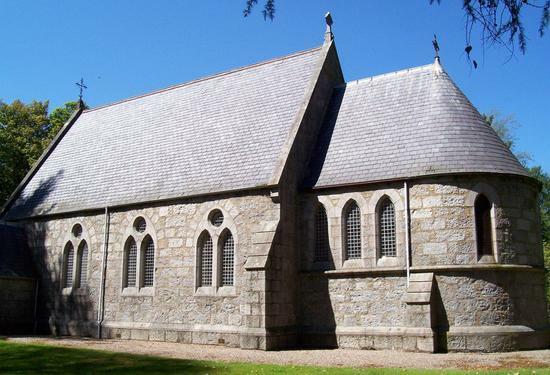 Above: St Drostan's Episcopal Church, Tarfside, at NO491798, built in 1879 by William Forbes (Hon. Lord Forbes) in memory of his brother, Alexander Penrose Forbes (1817-1875), who was bishop of Brechin, 1847-75. Alexander Simpson ?-1841-1851-? b. ca. 1814 Old Meldrum ABD; mar. 1844 Ann Henderson; issue: John T. D.; Margaret J.
Andrew Jervise recorded some monuments at Lochlee in his "Epitaphs & Inscriptions", vol. 1, pp. 127-31. 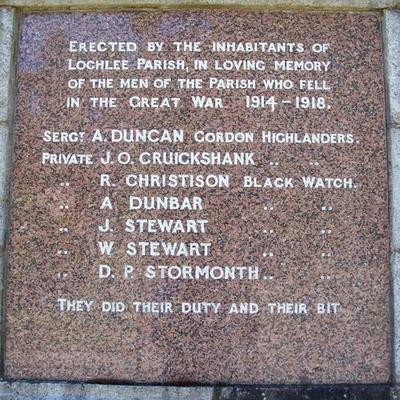 See also Scottish War Memorials Project: Lochlee, WW1 for further photographs and details. later, United Free; united in 1932 with Tarfside Maule Memorial as Glenesk Ch. of S.
Various records, 1840-1914, for Tarfside Episcopal Church are among the Brechin Diocesan Library Manuscripts at Dundee University Archives [ref. BrMS 11]. 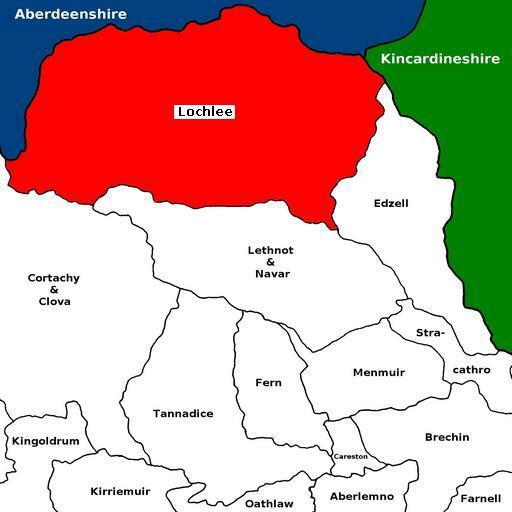 Lochlee was in the Commissariot of Brechin. Glenesk Retreat Folk Museum - has copies of local census and birth, marriage and death records. 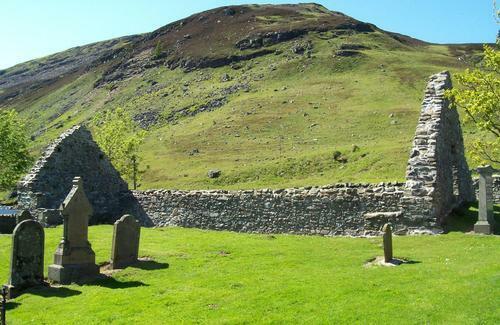 See also Angus Glens: Glenesk Museum.